"Look, there they are!" a mother says excitedly, pointing with gloved fingers in the winter cold. Her two year old daughter, swaddled in a giant, pink down jacket, face just peaking out through the hood, waddles over to her mother's side. Taking her hand for reassurance, she draws close to her mom. Her eyes grow wide and alive; she takes in a quick breath, then slowly and speaking just above a whisper, says one word: "Wolf…"
Placing each step carefully and delicately, its paws fall quietly through the fallen leaves as the wolf trots by. Its coat, a mottled grey with hints of copper, has grown appropriately full for the season. Halting suddenly, it perks its ears, investigating an unknown sound, only to take up a steady pace once again. This species is one that, at the turn of the century, was brought to the very brink of extinction only to be tentatively rescued at the last minute. It is a species that epitomized the New World and its vast, dark forests to the early European settlers. Yet today few even realize it exists. The red wolf, Canis rufus, endemic to the United States, once chased deer from New England throughout the Southeast and as far west as Texas. Smaller than its relative, the gray wolf and larger than a coyote, it has the presence of the former and timidness of the latter. The red wolf seems perfectly built for racing through the broadleaf forests of the east, taking down everything from white-tailed deer to small rodents. With the arrival of Europeans to these shores, the colonists persecuted the wolves mercilessly with a bounty offered for their heads. As settlers pushed further into the American interior the extermination continued; until in the early 1900s only small, isolated populations remained in remote corners of Louisiana and Texas. However, these few survivors were to be thrown a lifeline. In 1967 the red wolf was listed as an endangered species under the Endangered Species Act, putting the fate of this creature in the hands of the federal government. 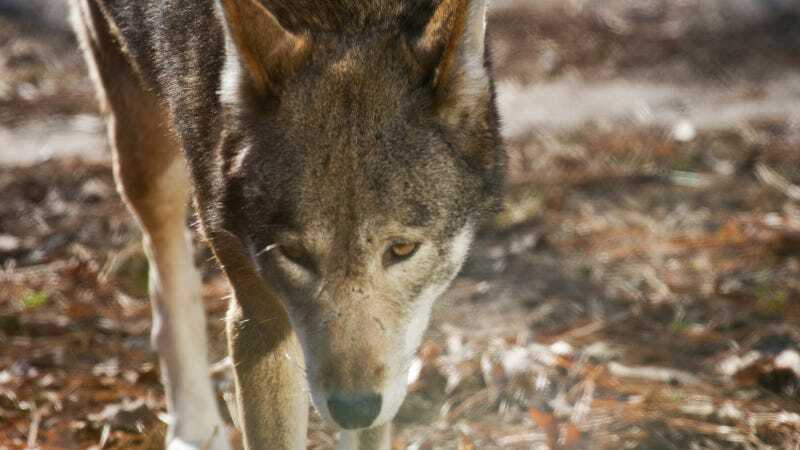 After being declared biologically extinct in the wild, a carefully managed captive breeding program was initiated, and the red wolf has since been reintroduced to the Alligator River National Wildlife Refuge in North Carolina. The first successful wolf reintroduction in the United States. This refuge, and five surrounding counties, remain the only place in the country where these wolves roam freely, and have done so for the past 28 years. Today, around 100 individuals stalk the area, slowly expanding their numbers. In short, a conservation success story. Although seeing one of these elusive animals in the wild is extremely rare, the refuge does run a number of "howling safaris" throughout the year where visitors can learn more about the wolves, the refuge, and howl into the dark with the canids. If you can't visit North Carolina, there are a number of captive breeding centers around the country that house these beautiful animals. I visited one such facility, the Salisbury Zoo in Maryland, home to two of the approximately 190 wolves kept in captivity. There are many challenges still facing the recovery of red wolves in the wild. The expansion of coyotes, which may interbreed with red wolves and occupy a similar niche, pose a significant hurdle. Also, because of their similar appearance to coyotes, red wolves are often mistaken for their smaller relatives by hunters, with each misidentification a heavy blow to the population. Death by gunshot is the number one cause of death for red wolves. The Federal government is unsure of what its next move will be in the recovery effort. US Fish and Wildlife have issued a full review of the program, with a decision expected in early 2015, stating that all options on the table. What that means exactly remains unknown. "We are nervous", said Kim Wheeler, Executive Director at the Red Wolf Coalition based in North Carolina, whom I spoke with by phone. "I think every red wolf supporter is nervous." "I think the three options on the table are: to cancel the program; pull the animals back to federal property; or leave the program as is, with changes. I hope it's the third...we hope they'll do the right thing"
Driving home through rural Maryland, snow covering the quiet forests and fields, I couldn't help but notice the flocks of geese numbering in the hundreds crossing the clear sky. As dusk approached, deer and turkey crept out from cover; the wind swaying the leafless trees. Our eastern forests have come so far after an unmeasured past. Wildlife populations have rebound; our forests have regrown. But there is still something missing. "In my opinion," said Wheeler, "it's the howl. It's that sound and knowing that that voice could have been silenced."